Hopefully this is the final set of posts coming from coffee shop internet!! Last week, after not hearing from our neighbor, I took a trip up to the Fibertel office to talk to someone in person. After waiting in line for quite awhile, I was able to speak to a guy and give him the copy of the contract that they had requested earlier. The guy didn’t speak much English, but could understand it just fine, and the same goes for my Spanish. I’m sure it would have been a rather funny conversation to overhear since he spoke Spanish to me and I responded in English. Regardless, it worked and we officially got an appointment setup for the installation guys to come to our house. The appointment is set for tomorrow morning (Monday), so please everyone keep your fingers crossed that we don’t run into any more issues! On to a more fun topic…. Our neighborhood. I’ve been meaning to share this with you guys for a few weeks now. When we first looked at different neighborhoods and apartments before we moved, there were a few criteria that we had for the perfect spot. They were: parks for the dogs, restaurants/cafes/grocery stores within walking distance (since I don’t have a car), safe to walk around, and more of a family environment. There were a few different neighborhoods that were high on the list. 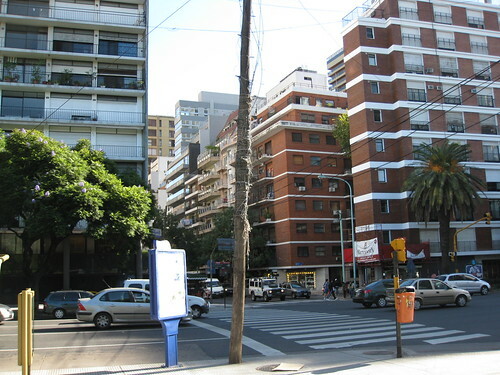 Puerto Madero: It is down by the river and is a much newer part of town. It is not very busy, and has gorgeous apartments and restaurants. It also has a large nature area that would be great for the dogs. 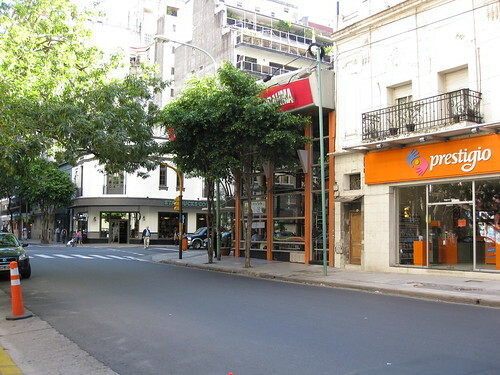 The biggest downside to Puerto Madero is that there are no grocery stores within walking distance. 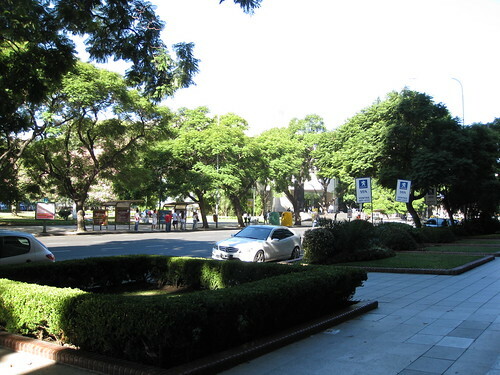 Recoleta: We looked at a few apartments in this neighborhood, and while it has some very beautiful spots, we just didn’t find something that felt like “home” here. 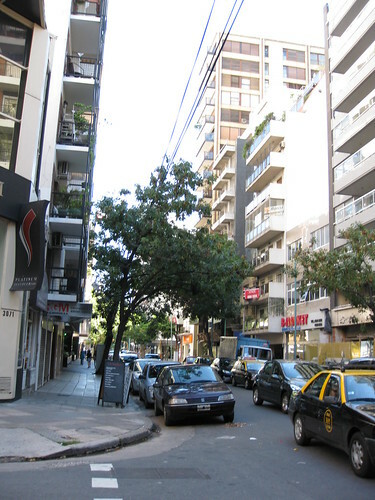 Recoleta is a bit closer to downtown than some of the other options which put most of the apartments in busier areas. Palermo: There are technically a handful of different Palermo neighborhoods (Soho, Chico, Hollywood, Viejo). When we visited in January, Palermo Chico was the neighborhood that we instantly both liked the most. There are a significant number of parks, a lot of restaurants and shops, and it felt a little more residential than the neighborhoods closer to downtown. We also learned that there are a significant number of schools in this neighborhood which would explain why it had a more “family feel”. When we first looked at apartments, there weren’t any available in this neighborhood that were furnished and had enough room for us. Sarah had emailed quite a few different apartment options to us while we were still in the States in hopes that we would be interested, and I instantly knew I would like the final one because of the neighborhood. Below is a series of pictures from our neighborhood. 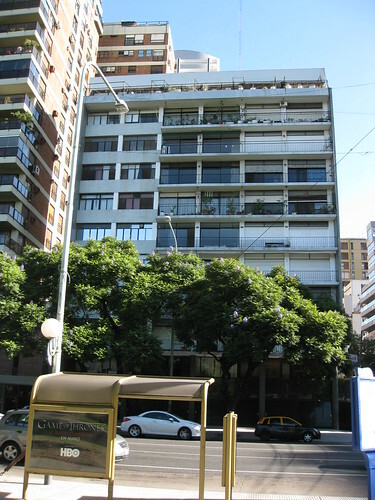 – This is our apartment building from across the street. – Looking from our corner towards the museum in the background. I love the amount of green in our neighborhood, even though it is a pretty busy part of town. – More apartment buildings around the corner. – A view down the street. I love the trees with the purple flowers! – The street around the corner. There is an ice cream shop, a hairsalon, and an italian food market on the left and a little supermarket, a vet clinic, and an electricians shop on the right. – Further down on the same street. There is a paint store, and a cafe on the right. And across the intersection, the infamous Starbucks! Coming up on the blog…. I have scheduled a post to go online tonight about my interesting experience at the police station…. and then tomorrow morning… a post about my first experience at the doctors office here. 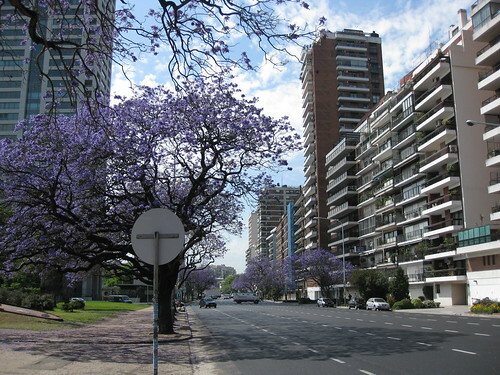 I love the purple flower trees as well! Looks like a nice neighborhood!